The OMNI Combo Hitch is our original 3 point hitch platform. It's unique versatility is where our OMNI named was derived. 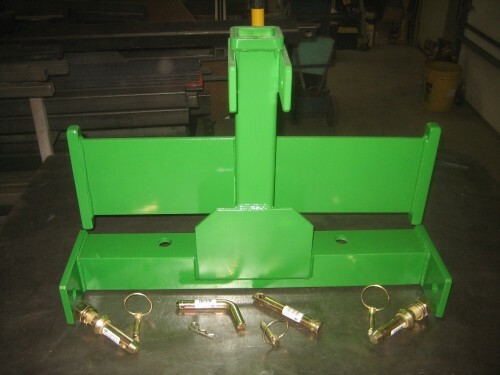 It is compatible with IMatch and most other quick hitch assemblies.The hitch platform can be used with your tractors 3 point hitch as the basic foundation for our Combo Hitch accessories and implements and top mount accessories like the Tool Bed, Goose Neck Ball, Lifting Boom, Clevis Mount, Hanging Tree, and Spot Sprayer Mount. The Design, Materials, Construction and Workmanship is the best we can come up with for this segment of the market. We use 3/8" and 1/4" steel throughout. No stamping or production parts. This Combo Hitch has a Suitcase Weight Rack welded to it capable of holding up to eight 42lb weights. We can build in different configurations to work with whatever type of suitcase weight you have. Each OMNI Hitch is individually assembled and MIG welded by skilled American workman in our Northern Minnesota Facility. If you have visited our "section of the woods" you are aware that not only will you enjoy the "Minnesota Nice" experience but have also seen where our reputation as old world craftsmen with an attention to detail due to our northern European and Scandanavian Heritage has originated. Feel confident that you will be buying a robustly constructed product backed by an obsession for the ultimate in customer service and satisfaction. A little innovation in design and features can't hurt either. The standard finish on this hitch is Gloss Black enamel paint. Gloss Enamel in JD Green or Kubota Orange is available as an option. Ford Blue, International Red, Allis Chalmers Orange, Massey Ferguson Red or Gray, JD Yellow and Cub Cadet Yellow available with special order. I bought the OMNI for my JD 2720. JD's iMatch system is well engineered, but JD hasn't integrated it very well for their implements and accessories for compact tractors. I wanted an iMatch alternative to the ballast box, and the OMNI hitch fits the bill. Its class 3 receiver is an added bonus that I use to tow a small flat-bed trailer around my property; and it has turned my tractor into a convenient tug to maneuver my boat and 16' cargo trailer. The quality is high, and the price is right. on 2/24/2012 Good combo hitch. Paint quality needs to be better. Bought this combo hitch for my new JD 1026r because I didn't like how far the ballast box stuck out. This combo hitch takes 8" off the length of my tractor. My only complaint is the paint on my hitch was a bit thin! Primer showing through in a few areas. I ordered this item along with the Speedco hook and the three point ripper bar. It was super beefy and the paint job was excellent. I know for a fact that the finish means a lot to the JD boy like me. The welds were class and you can be proud to have this part on your Green tractor. All the parts were of excellent quality, I,m proud to have this on my JD 1026r tractor. Keep up the good work and remember BEEFY IS BETTER cost is secondary to me. This product is exactly what I have been looking for. I move trailers and use the loader quite a bit. Build quality looks first rate. Not sure how you got all that packing paper in box, but it arrived in good shape.